Shams-ud-din Iltutmish (reigned: 1211-1236) was the third ruler of the Slave dynasty. He founded the Delhi Sultanate in 1211. 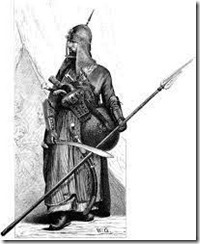 A descendent of Turkic nobility, he was captured and enslaved. 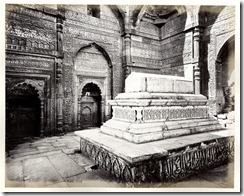 Iltutmish later rose to prominence in the court of Muhammad Ghuri and thereafter in Lahore under Qutb-uddin Aibak. He dethroned Aibak’s successor, Aram Shah, and moved the seat of the Sultan to Delhi. The striking white cenotaph pays homage to the memory of Iltutmish but the actual grave remains hidden in the vault below the tomb. second decade of the 20th century. In 1914, during excavations conducted under the supervision of Gordon Sanderson, the Superintending Archaeologist of the Archaeological Survey of India, the actual grave chamber was found. From the north of the monument 20 steps lead down to the real burial vault. However, like the interiors of Qutub Minar, it is not accessible to visitors. He commissioned many buildings, including Mosques, Khanqhas (Monasteries), Dargahs (Graves) and a Hauz (reservoir) for pilgrims. Shams-ud-din Iltutmish or Altamash (1167-1236) after ascending to the throne, realised that Turkish nobles were not trustworthy and could conspire against him to overthrow his rule. Therefore, he had a group of faithful slaves to protect him. This group was known as Amir-i-Chahalgani, or The Forty. Sultan Shamsuddin Iltutmish was greatly enamoured by a Turkish slave girl in his harem, whom he had purchased, and sought her caresses, but was always unable to achieve his object. On making further inquiries it was found that the slave girl was his own sister. They had both been sold as slaves, in their early childhood, by their half-brothers; and thus had Almighty God saved him from committing a great sin. 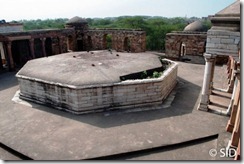 Nasiruddin Mahmud was the most renowned prince and the ablest son of Iltutmish. He breathed his last in 1229 a.d, in Bengal. Iltutmish was very much aggrieved at the premature death of his eldest son. He did not have good opinion about his second son Ruknuddin Firoz as he was given to sensual pleasures and had no sense of responsibility. The other sons of Iltutmish were too young to undertake the responsi­bility of the state. 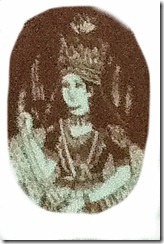 Iltutmish, therefore, decided to nominate his daughter Raziya his successor who was a very clever, brave and bold lady. which can be translated into “the blessed of the earthly world and of the faith”. Iltutmish became the first sultan to appoint a woman as his successor when he designated his daughter Razia as his heir apparent. (According to one source, Iltumish’s eldest son Nasuddin Mahmud, had initially been groomed as his successor, but had died prematurely.) 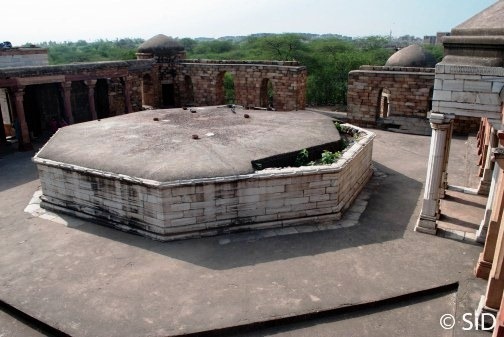 But the Muslim nobility had no intention of acceding to Iltutmish’s disregard of tradition in appointing a woman as heir, and after the sultan died on April 29, 1236, Razia’s brother, Ruknuddin Feroze Shah, was elevated to the throne instead. Ruknuddin’s reign was short. With Iltutmish’s widow Shah Turkaan for all practical purposes running the government, Ruknuddin abandoned himself to the pursuit of personal pleasure and debauchery, to the considerable outrage of the citizenry. 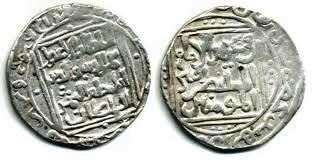 On November 9, 1236, both Ruknuddin and his mother Shah Turkaan were put to death – after only six months in power. According to Minhaj Siraj, the author of the contemporary chronicle Tabqat-i-Nasiri, “Shah Turkan” was a Turkish hand-maid, and the head [woman] of all the Sultan’s (Iltutmish’s) haram. 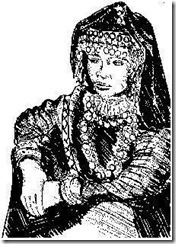 She manipulated to prefix the title of Khudawand-i-Jahan to her name and rise to the position of “the greatest [of the ladies] of the sublime haram, and her place of residence was the royal palace”. She used to confer lavish presents upon the nobles of the court in order to win support for her son for the throne. She caused royal orders and decrees to be issued in her name and tortured many favourite ladies of Iltutmish after his death. His mother, Shah Turkan, who was, in fact, a maid-servant earlier, captured all the powers and proved a wicked conspirator. She won favour of the nobles and courtiers. Rukhuddin Firoz could have ruled for a long time if he had acted wisely but his overwhelming ambitions and love for sensual pleasures defamed him and the people began to oppose him. The powerful Shamsi governors declared their indepen­dence as they were not prepared to be ruled by an incompetent ruler like Ruknuddin Firoz. She also conspired to assassinate Razija. Razia was fond of horse riding early in the mornings. 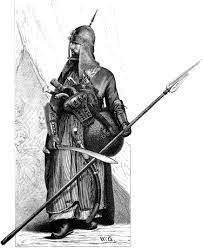 Shah Turkan had ordered a deep ditch to be dug in the riding path of Razia for her to trip and be killed. However, the conspiracy was revealed to Razia on time and she was saved. 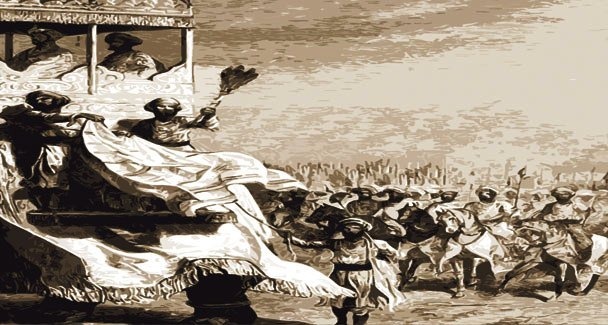 All of Shah Turkan’s cruel activities roused a feeling of hatred among the nobles and they realized their mistake Revolts cropped up in many parts of the Sultanate of Delhi. This entry was posted in History and tagged Iltutmish, Nasiruddin, Razia, Shah Turkan, Sultan Shams-ud-din Iltutmish. Bookmark the permalink.